Our friend Josh shows how honey combs are uncapped. Bees cap the combs with wax to help preserve it - the wax must be cut off by machines like this one so the honey can come out. Josh was the master beekeeper on a Hutterite settlement in Manitoba. The Hutterites share work and profits equally in communities which they call colonies. 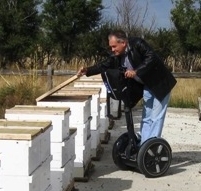 Many of their Sunday sermons use the honey bee colony as an example of a harmonious, disciplined life style which can be emulated for successful and prosperous living. Honey is made by honey bees. The little creatures fly to millions of flowers, gathering tiny droplets of nectar which the flowers offer to the bees in trade for pollination services. The bees convert the nectar by enzyme processes into honey. The bees need the honey as their only source of carbohydrates, or energy food. The honey is stored in wax combs which the bees also make for themselves. The bees store the honey for use as food during times when flowers aren't blooming. These times are usually winters in temperate climates but may be rainy or drought spells in tropical climates. If lots of nectar producing flowers blossom, the bees may store much more honey than they could ever eat by themselves. This excess honey may be harvested by beekeepers. In some parts of the world a great deal of excess honey may be made by the bees. For example, occasionally the eucalyptus forests of Australia yield enough nectar for bees to store over 150 kilograms (330 pounds) of excess honey in each hive. The Canadian Prairies have clovers and alfalfa fields that may give hives a hundred kilograms (220 pounds) of excess honey in a single summer. 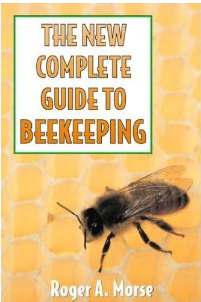 Other areas, such as the New England states of the USA are very poor for bees and many beekeepers can harvest only a tenth as much honey each year. The reasons some areas may be very good and others poor are related to local climates, soil types, and density of nectar-bearing flowers. Honey comes in many forms. 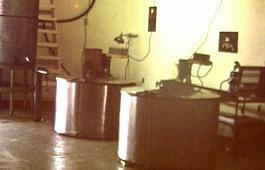 Extracted honey is liquid honey which has been removed from the honey combs by the use of centrifuge equipment. These machines are called extractors. Comb honey is honey which is still in the original wax combs made by the bees. This honey is less adaptable to cooking or mixing in tea, but is relished by connoisseurs who prefer its natural flavours. Honey comes in lots of different colours and flavours. If you think about it, you will realize that the scents of different flowers are remarkably variable - a rose does not smell like a dandelion - and it follows that the nectar given off by the flower will smell and taste different as well. Soil chemistry and honey-comb quality are also factors influencing how honey tastes and looks. Honey may vary from white and clear (usually alfalfa honey from drier, alkali soils) to very dark (buckwheat from acidic soils). Colours between these extremes range through pleasing golden, red, and even green hues! Honey has long been respected as a healthy substitute for white sugar. It has a few extra nutrients and is a little easier on the digestive system. We won't try to make wild claims about the goodness of honey, it isn't necessary! So, why do we love honey? It's natural, sweet, good food that has an interesting history, pleasant flavour, and may even do you a healthy favour! 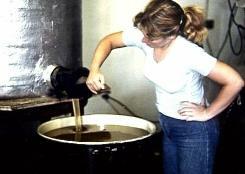 This young lady is filling a 670 pound barrel with honey. Much honey is exported to the world in big drums such as this one. The buyer, a honey packager, will filter this honey and put it into small consumer sized containers, then distribute it to retailers. These big, round tanks are extractors, or centrifuge machines, which whirl the honey-combs around so the honey is separated from the wax comb. 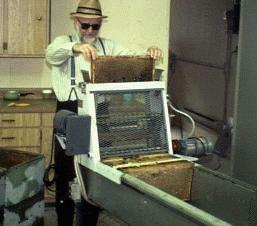 Most beekeepers use equipment similar to these extractors to produce the liquid honey which can be shipped in barrels.